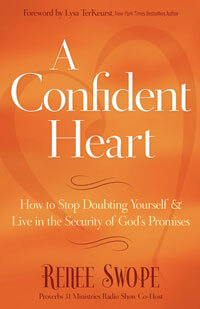 “Have you I let the gospel of God’s grace move from your my head to your my heart, so that you I know without a shadow of a doubt that you are I am known intimately and loved completely by God?” “A Confident Heart” pg 41. I grew up in a wonderful, complete, warm and loving family. Mom and dad saw to it that we were in church every weekend, that we attended weekly religious instructions, and received all of the Sacrements of the Church. I grew up knowing about God. I knew OF Him… I just didn’t KNOW Him. I knew that God loved me. I just didn’t know how deeply and how He truly loved me and how much He longed for a relationship with me. I didn’t know that He wanted a relationship with me that would last for all eternity. All is knew at that time is that if I followed all the rules that that would be good enough to get me into Heaven. It wasn’t that He was distant or unapproachable – I knew that He heard my prayers. I knew that If I confessed my sins and said a “good” pennance that all was forgiven. It wasn’t until many years later – when I was hit with a health crisis – that I ran back to the religion of my childhood. I say ran back – because for quite some time (many years) I had strayed from the Church. The health crisis averted and I continued “in the Church”. The key here is “in the Church”. I was in, at, and around the Church – the building, the services, the programs. Where I wasn’t was… in Him. With no sure footing… no anchor… nothing to hang on to… all it took was one huge family crisis to knock me off my feet and back “into the world”. I came to the realization that “the world” and my life and all that I was trying to do was meaningless, that the people and places and accolades where I had put my hopes was false. I knew that I had to find the truth. And so began the search. While I knew of Him, I didn’t know Him. I didn’t have that deep, filling, totally-absorbing, soul-abiding, fully-accepted, sin-forgiving, joyous relationship with my Savior. I didn’t know that when I was scared, tired, overwhelmed, beaten up, torn down or any combination thereof, that I could run to Him and that He would hide me from it all. I didn’t know He would heal my wounds or that He would nourish my soul. I didn’t know that He would give me the strength for the fight and that in HIM I would find that peace that I so wanted, needed, longed for and searched for. No that realization took many years. But thank you Jesus, that I had an incredible mentor… my mom. I had watched her life over the years when she had come to the same realization about the difference between knowing OF Him and KNOWING Him. In her, I saw truth – THE TRUTH. As so it began. What I found when I searched for Truth was hope and joy and peace and forgiveness and redemption and love and security and confidence. I found Truth in His Word. I found forgiveness in His Word. I found joy and peace in His presence. I started this journey to know and become the woman that He created me to be in Him and “being confident of this, that he who began a good work in you will carry it on to completion until the day of Christ Jesus” (Phil 1:6 NIV) I learned how to experience the fullness of His love. I now knew that Jesus would meet me where I was. When I sat at my husband’s bedside and watched him to take his last breath, Jesus was there beside me. When my heart was shattered and broken when I buried my mom, Jesus was there beside me. When I said goodbye to my sister-in-love, Jesus was there beside me. When I struggled to find my way as a young widow with serious financial woes, Jesus was there beside me. When I heard the diagnosis of ovarian cancer, Jesus was there beside me. I wish I could tell you the day that the Gospel of God’s grace moved from my head to my heart. I wish I could write out the steps that I took so that you could have a direct formula to get there and you would not have to go through all the crazy steps – and mis-steps – that I went through. But I can’t. What I can tell you is that God’s grace is there waiting for you. Maybe you’ve never felt His love and grace before… or maybe you’ve slipped away from Him… or maybe you know OF him and now you want to KNOW him in a deeper more personal way. Whatever it is that is going on in your life I urge you to commit- or recommit – your life to Him. If you would like to accept Jesus as Lord of your life, you can pray the following prayer or use it as a guide to create your own. Just talk to God from your heart, with honesty and sincerity. If you have prayed this pray, I encourage you to reach out to a local Bible-Believing Church. Pick up a Bible and begin reading and studying the Book of John and Acts. Seek out others to guide you in your walk. Seek Him and He will find you.